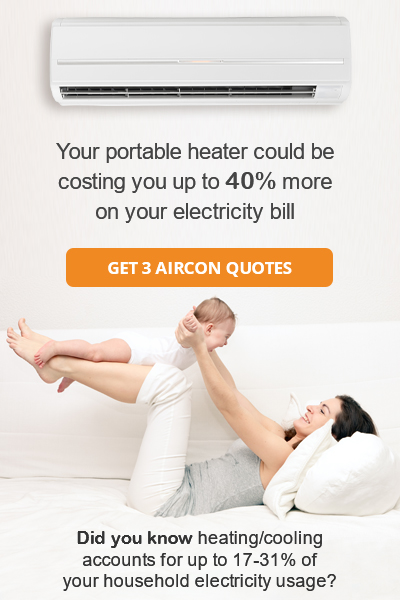 If you are using a portable heater, you could be spending up to 40% more in Australia’s colder months*. The reason that portable heaters are so inefficient is due to their inability to regulate temperature. Without a thermostat, these portable heaters burn through your money and keep electricity bills high. Did you know that heating/cooling accounts for between 17 – 31% of your household energy usage**? An energy efficient air conditioning system can cut these running costs by up to 40% and still keep you warm and toasty. Get 3 quotes on an energy efficient air conditioner and start saving up to 40% on your electricity bill.